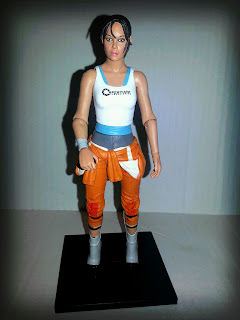 Chell comes in right around 6 1/2 inches tall and is sculpted in a fairly realistic style. 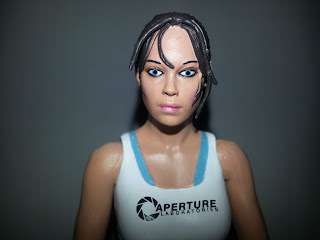 Of course, rarely do we see Chell in the Portal games (they're first person games without traditional cinema scenes) but NECA seems to have done a nice job transferring the game's realistic looking character into action figure form. She's dressed in her outfit from Portal 2 (you can tell because she's not wearing the full orange jumpsuit) and comes with a stand (pretty much required for her to stand up) and the portal gun. While Chell is very much intended to be displayed on your shelf, desk, or entertainment center, she does have quite a bit of articulation that gives you some different options when posing her. Chell has balljointed knees, ball jointed hips, a swivel waist, a ball jointed abdomen, ball jointed shoulders, ball jointed elbows, ball jointed wrists, a ball jointed head, and a swivel jointed ponytail. Due to the shape of the unique boots Chell is wearing, she is unable to stand without the aid of her display stand. While she has some leg joints, the thigh joints are a bit restricted by the top of her jumpsuit so you're probably only going to get her into pose with one leg up as if she's walking. The upper body joints give her a nice range of movement so she can hold the gun (or whatever accessories you give her). The head ball joint on the head really has some nice movement to it. I think movements of the head really give figures the ability to express emotion and Chell's is fantastic. All of the joints are nice and solid as well as being well hidden. Just looking at this figure, you're not going to guess she is is as articulated as she is. It's NECA, so you know we're going to get a strong sculpt. While this isn't the most impressive sculpt we've seen from them recently, it's still quite effective. That probably has to do with the fact that Chell isn't a character that's designed to be seen by the player too often. She's a fairly average young woman in her late 20's/ early 30's wearing an orange jumpsuit with the jumpsuit top tied around her waist (the top of the jumpsuit is a separate (non removable) piece that is quite rubbery. The jumpsuit has some nice texture to it and the knees have square knee pads and lots of folds and wrinkles. She's wearing a white tank top over a blue athletic undershirt. Both shirts have some wrinkles around the stomach and waist. I think my favorite part of the sculpt is Chell's face. One one hand, she's fairly plain. Chell was simply a woman trying to escape from a laboratory, so her hair is tied back in a very utilitarian pony tail. On the other hand, the way that her hair falls in front of her face, accompanied by her gorgeous eyes, really makes me think of Olivia Wilde, a very lovely actress. Her boots are another interesting aspect of Chell's sculpt. They're designed to somewhat mimic the shape of something like high heels, but they have no heel; instead they have a large, curved strip of plastic that comes off of the calf and wraps around down towards the heel. In the game, I think these aid Chell in being able to fall from great distances without being hurt. Shape of the boots is unique and there's some excellent details on the heels, just be careful with the strips of plastic as they seem like they could be a bit brittle. There's not a lot of fine paint detail on Chell; most of the aspects of her outfit are fairly solid in color. I've already mentioned the nice work done on her face, especially her eyes, but her lips are very delicately painted as well. One aspect of the paint that will stand out is the "Aperture Laboratories" logo on her tank top. It's very cleanly applied and very legible. Her knee pads have a reddish wash applied over the solid orange of her jumpsuit; is this blood that she knelt down in? If so, it looks quite impressive. Not overdone, but very subtle. The only weak paint on the figure is around the boots. While the sculpt was impressive, the paint lines, especially around the boot straps, is a bit messy. Chell needs her base to stand. While I wish they would have tried something more imaginative (perhaps at least cast in white or grey) Chell's base is a simple square tile divided into four smaller squares. She stands on it solidly and firmly. The accessory that really makes this figure, however, is the Portal gun she comes with. 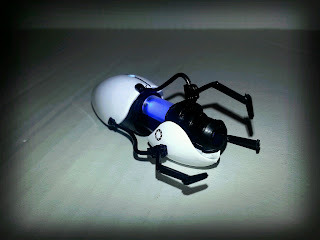 Used in the game to open the titular portals, the portal gun is a beautiful accessory. Not only does it feature some very intricate sculpting and excellent paintwork (the "Aperture Laboratories" name and logs are clearly applied here, also) but it also features a working action feature: push a small button on the bottom of the gun and the barrel and core of the gun light up with a glowing blue LED light. This accessory is so well done that it feels more like a miniature prop replica than an action figure accessory. 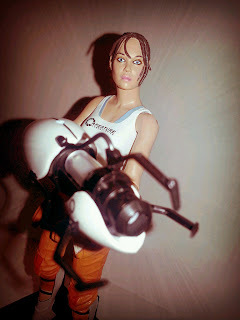 Chell can hold it well, just be careful with the plastic struts alongside the gun; they're also made of a brittle plastic. While I haven't yet had the chance to play Portal 2, I loved Portal and plan on getting around to the sequel. That being said, while Chell isn't the most exciting or iconic protagonist, NECA did make a nice figure. It's really the excellent face sculpt and the brilliantly designed portal gun that help make this figure exciting. 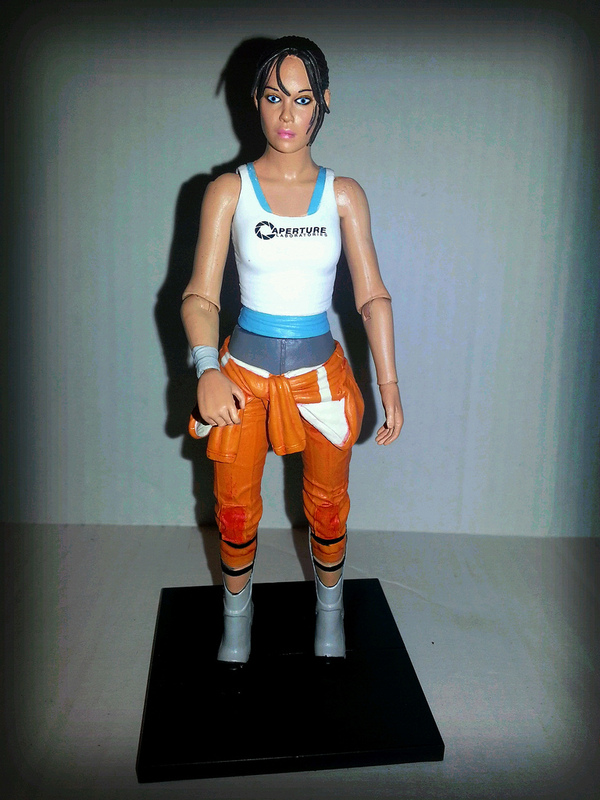 Unless you're a die hard Portal/Valve junkie or just love video game figures, you could probably skip Chell, but for fans, you'll be happy with how she turned out. She's designed to be an excellent desktop companion and she certainly excels in that. I'm rating her a Good and a 1/2 overall because of the head sculpt and Portal gun. Barbecue17 loves orange jumpsuits, evil computers, and cake. But look at him talking when there's reviewing to do! Instead of wasting your time, you should check out his Flickr account to see more cool action figures and toys. So the hands should be able to move at the wrist? Because with mine, the moment I tried to move the hand it snapped clean off. So damn disappointing. Yeah, I was really disappointed. But I took it back to the retailer and got a refund, wanted to swap for another but the one I got was the last one they had. I'll just have to try and get it some place else I guess. does her head come off for custom figures?